I'd really like to be able to list two dozen, or perhaps at least 10 completed projects on this page. Unfortunately I rarely seem complete (or even start :) much of what I envisage. The items listed on this page are those that did get finished in one form or another. None look as nice as I'd like but all worked fairly well to my liking. I figure at least these projects got built! Hopefully this list will be added to over time, that's partly what this site is about. As shown, neither of the two transmitters are enclosed - this approach should be used with caution for obvious safety reasons. Please read the comments on safety and site disclaimer here if you are tempted to try anything like this. 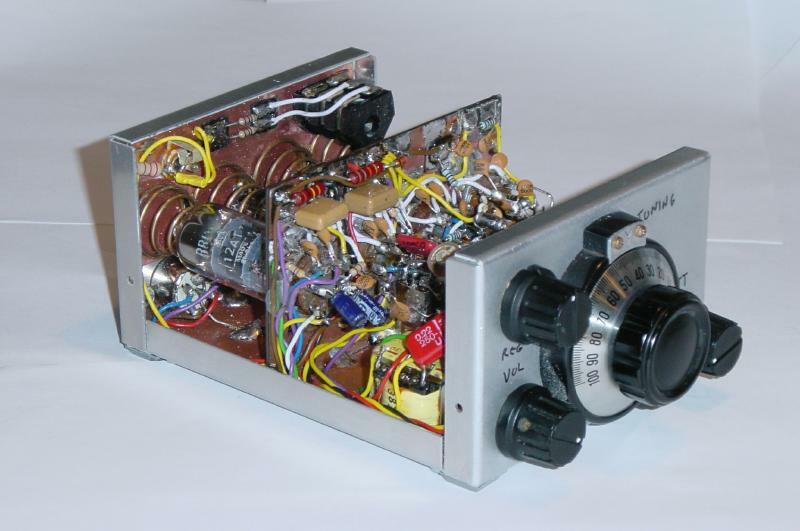 This project was inspired by a sense of wanting to build something a little unusual rather than with the expectation that it would become a useful transmitter. At the time of writing I'm at the breadboarding stage and have yet to decide if I will keep the unit in its current form or dismantle it to re-use some of the parts in other projects. One of my friends egged me on to build this device and although the rather large size of the valve is more his enthusiasm, I did get to wondering if I could actually use this on air. The valve is a Russian made "GM100" directly heated triode. This valve will withstand anode voltages of up to 5 kV, pass currents of up to 1.6 amps (!!!) and has an anode dissipation of 1 kW. The filament takes a massive 18 amps at 17 volts although the only slightly suitable transformer I have drives the heater to about 15.5 volts which is still pretty bright. To give some idea of the scale, the tiny tube on the left (by the multimeters) is a 12AT7 double triode, the larger tube on the right hand is a 3-500Z, a modern 500 watt triode. 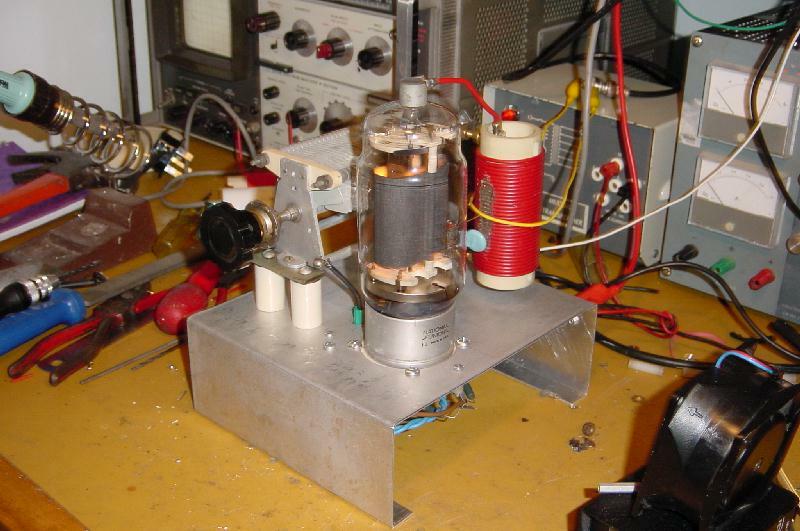 The variable capacitor and inductor shown in the photograph are moderately big components, at least by UK ham standards, but are dwarfed by the huge tube. Having "short" wiring is obviously quite difficult on something so large but ferrite beads on the grid and anode leads seem to have prevented parasitic oscillations. To run this tube at full power much larger components would be required and the wooden frame would probably be a fire risk! The whole rationale behind this transmitter is to under-run the tube in the interests of frequency stability and longevity although the heater power consumption is a little excessive. The circuit I've used for this is identical to that of the 812 Hartley shown further down the page. 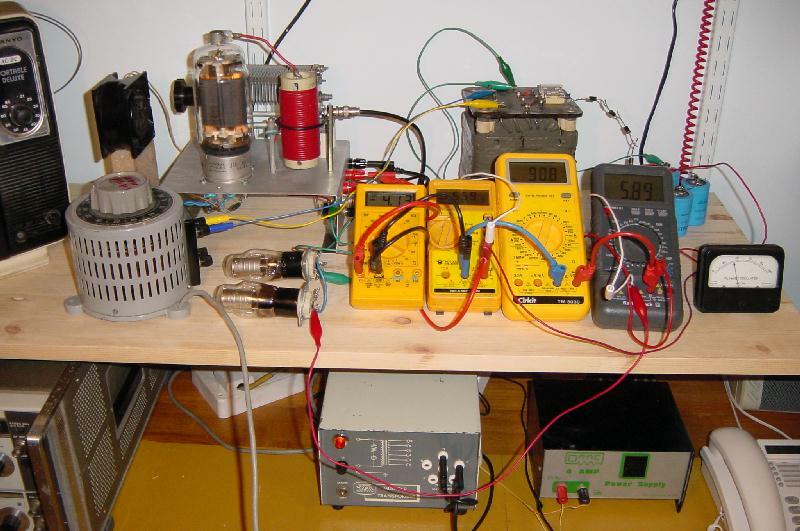 At the time of writing, 20 watts of RF has been obtained at 1.9 MHz with a 730 volt supply drawing about 55 mA and a good 80 watts output with 1300 V and a little over 100 mA. The harmonics are -30 dB WRT to carrier (or better), not a great figure but ok with a low pass filter or at a low power. Like the 812 Hartley, the output seems best taken via just a single turn link winding so as not to overdamp the tank circuit. I've a fair amount of work to do to make this into a viable radio. Firstly I have to ensure the frequency stability and tone are good enough to use on air and secondly I have to complete the PSU circuit; at present it's a bit of a lash up. The unit will probably operate best using 1 or even 2 kV HT and so some form of enclosure or restricted access is (obviously) essential. 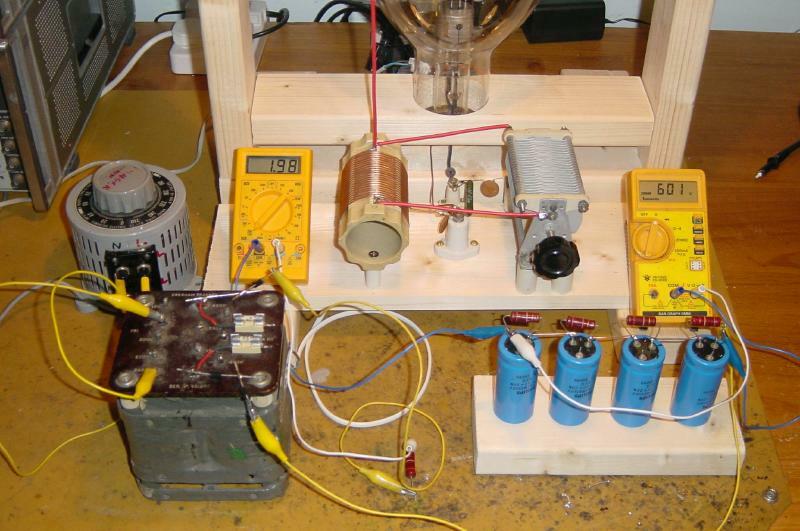 Most of the experimenting has been done with only 100 or 200 volt HT. My progress on the 40m SSB transceiver project has been stalled since June and so I thought I'd put it on the back burner and build another (relatively) small project to get over the blues! A little travel this year has highlighted the fact that I have no portable Ham equipment and so I decided to build a small valve receiver for the 40m band. A rather obvious advantage of the higher frequency bands is that they require smaller aerials and so are more suited to portable/temporary operation than say 80m or 160m. I decided that I might have trouble getting a regenerative receiver to perform as well as I wanted on 40m and so elected to use the slightly more complex "regenerodyne" design where a conventional tuneable regenerative detector is prefixed by a mixer using a fixed local oscillator frequency. With this arrangement it's possible to down convert from high frequency bands to a relatively low frequency where the regen detector can work its best. By using a switched local oscillator frequency and suitable input filters it's possible to make a multi band receiver (with constant tuning on each band) but I decided to make my first regenerodyne just cover one band. 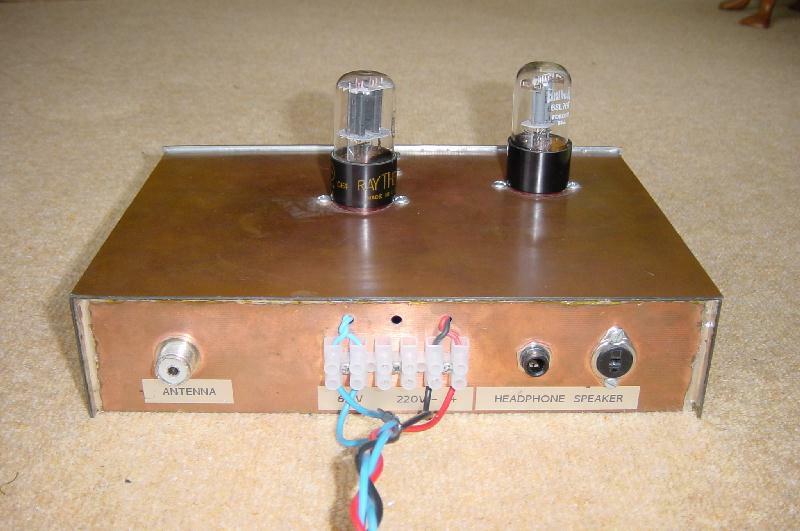 The regenerodyne concept was first used in the 1920/30s to provide stable reception on the higher HF bands whilst using simple regenerative receivers. The name was more recently coined by Gary, WD4NKA who is probably the main (current) exponent of this design. You can find his interesting pages either from my links page or directly from here. With space at a premium (I'd already picked a small case :) I decided to try some miniature Toko coils I had a number of. These will adjust between about 4 and 7 uH and have a tap on the main coil as well as a separate link winding. The Toko part number is KANK3334R. After much deliberating and bit box searching I worked out that a 25 pF variable capacitor would just about tune 100 kHz with one of these coils set to maximum inductance (and the right fixed capacitors as well). I found a 10.165 MHz crystal and so my regen has to tune 3.165-3.065 MHz to cover 7.000-7.100 MHz with this crystal. The tube line up is: 6C4 xtal oscillator, 12AT7 mixer (Pullen configuration) 6BH6 regen detector and 12AT7 1st and 2nd AF amplifiers. Operation is via headphones and/or loudspeaker. The audio output transformer is a tiny mains 240->3-0-3 Volt 200 mA unit. The radio is wired for both 6.3 and 12.6 Volt heater operation with a HT voltage of between about 120 and 180 volts. Power is connected via a 6 pin DIN connector, the internal connections in the plug selecting the heater voltage. The four tubes used provide 6 active sections, all are triodes with the exception of the 6BH6 pentode. The regeneration is controlled using an adjustable DC voltage on the 6BH6 screen, it's cathode being connected to the tap on the Toko coil. I tried the 2 main connections on this coil both ways round to get the best regeneration operation. During testing I obtained a sensitivity for the regen (using the signal generator on 3.1 MHz) of about -120 dBm for a 10 dB signal to noise ratio, a good result. Front panel controls are volume, regeneration, input attenuator and tuning. There is no antenna trim control (yet). The back panel connections are antenna, power, speaker and headphones together with an earth terminal. I will make a lid for the unit using perforated metal sheet I have. The idea of putting the valves inside the unit (as opposed to sticking out of the top) was so that it could be transported easily. The springs that can be seen in some of the photos keep the valves well pushed into their sockets. This first listening test proved both encouraging and disappointing. SSB stations were heard from Germany, Russia, Scotland and Spain in about 20 minutes of listening. Problems identified were lack of filtering on the front end allowing out of band signals through to the detector and also a lack of sensitivity. The mixer bias and mixer to regen connections have not been optimised yet and tests with the signal generator revealed that the set is now at least 20 dB less sensitive with the mixer than my original tests with just the regen! In addition I suspect that the Q of the first band-pass filter is too low because of the loading effect of the low impedance link winding. I may replace this coil by a toroid wound to provide a greater impedance transformation. There is a lot more work to do on this set but it seems to have got off to a reasonable start. The mixer and/or mixer to regen coupling is/are obviously not working well but I will come back to it in the next weeks I hope. For now it's mission (partly) accomplished! I like simple circuits and a "Hartley oscillator" transmitter is probably about as simple as you can get, at least in part count terms. From what I've gathered, Hartley transmitters were in vogue in the 1920s and perhaps the early 1930s. Generally they employed a single active device although two devices could be used in "push-pull". All Hartley oscillators feature a tapped coil, either in the cathode or anode circuit, the transmitting Hartleys employing a single valve have the tuned circuit connected to the anode. I chose to build a Hartley as it requires no RF Choke (of which I'm short of here) and it seems to have been the most popular single tube power oscillator circuit. The received wisdom is to aim for a much smaller output power than the same device would be able to provide when used as an amplifier. The approach may limit frequency drift due to heating effects and should also make the device harder to damage. I have built three versions of a 160m Hartley, dismantling the old versions as I continued the development. The first Hartley was a "lash up" on a piece of wood and used a 203A triode. 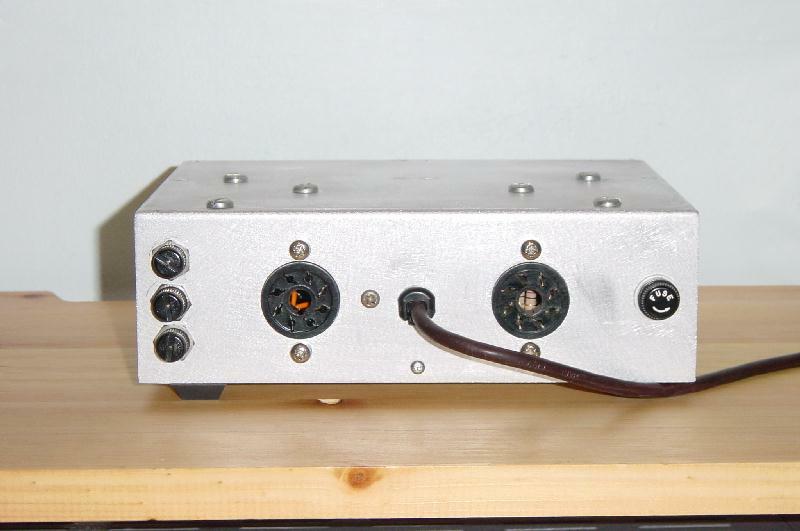 The second was built using an aluminium test chassis, and used to gain experience and evaluate the circuit prior to building a more permanent version. 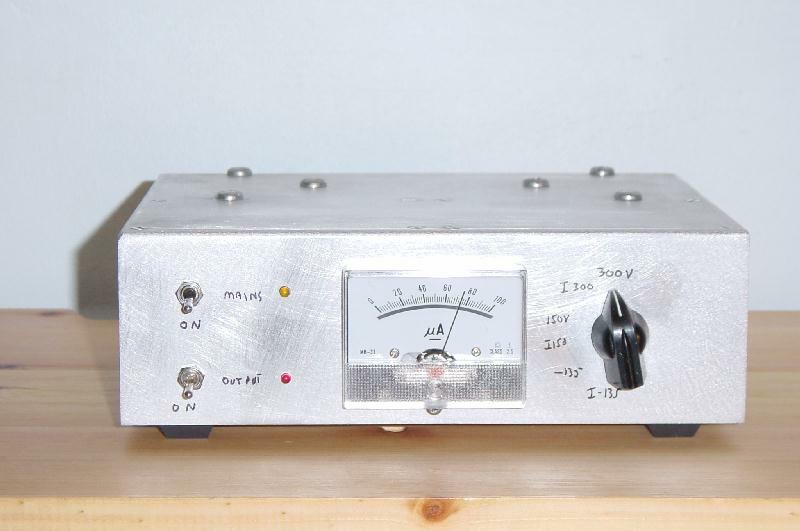 The latest incarnation (Feb. 2002) is a tidier version using a single 812 triode on an oiled pine base. I've detailed these transmitters below in reverse chronological order. All shared the same tank circuit I made from a wide spaced EF Johnson variable capacitor and a ceramic coil former wrapped with heavy gauge insulated plastic wire. The variable capacitor has a 6:1 slow motion drive on it which makes the frequency a little easier to set! 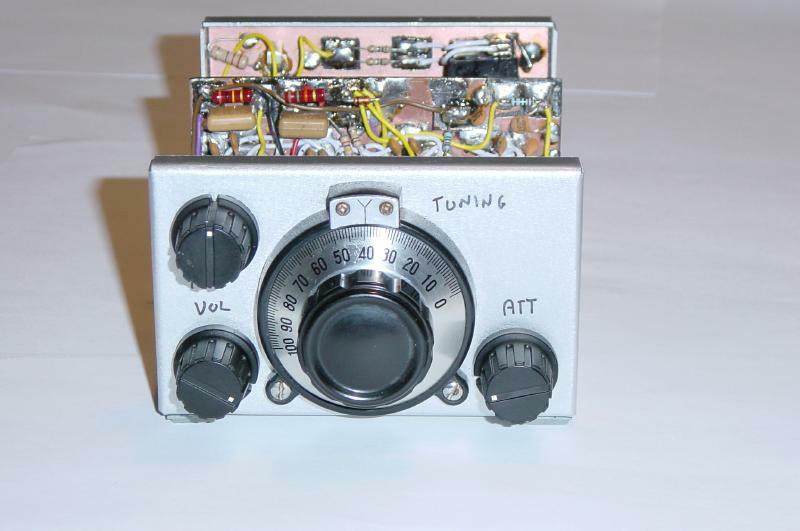 The tank circuit tunes quite a wide range of frequencies and covers all of the 160m and 80m Amateur bands. My hope was I could use it on 80m as well as 160m. Limited tests to date have indicated it's too drifty for 80m use unless your QSO partner knows what you are using and appreciates the pitfalls and joys of simple LC power oscillators. Many people have built substantially better performing Hartley transmitters and I still feel I have "unfinished business" with the implementation of these devices. I have decided however that the next LC power oscillator I build will be of "Tuned Plate Tuned Grid" design. 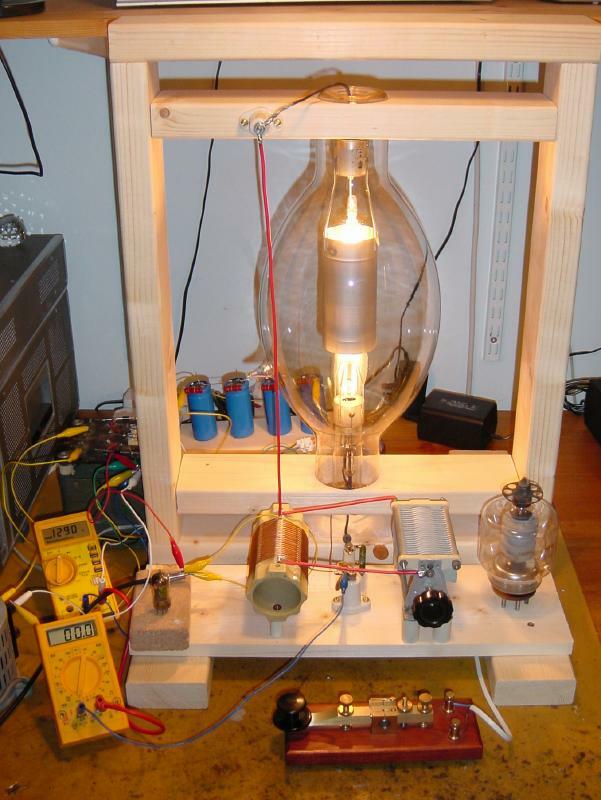 Based on the experiments with the test chassis, I decided to use the 811A triode and rebuild the circuit on a wooden base. As I already had the assembled tank circuit I was able to simply transplant this to the wooden base I made and add the correct 4 pin socket for the 811A. The 811A isn't really the best valve for this sort of circuit because it is designed to run an appreciable grid current and also takes relatively little anode current at lowish HT voltages (as compared with a conventionally biased valve). I'd heard stories about 811 oscillators not starting well but I didn't in fact have any problems with this. 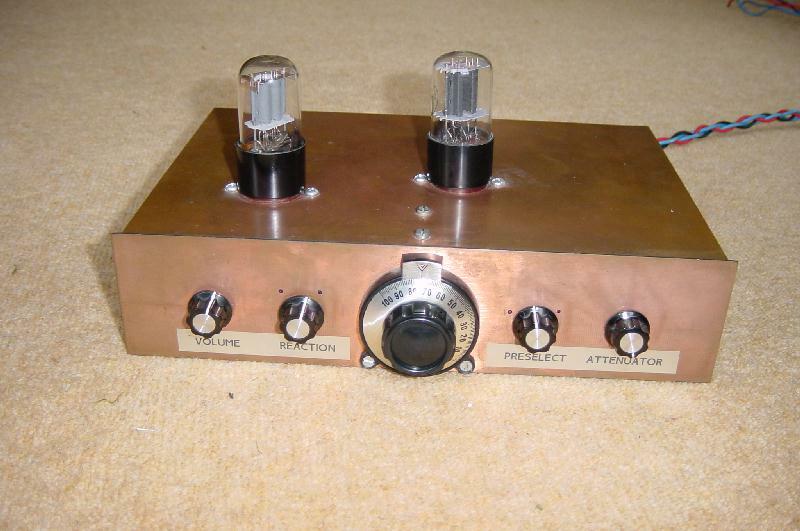 After some experimentation (and burnt fingers on the undersized grid leak resistor) I decided to try an 812A triode. The 812A is identical to the 811A in terms of anode dissipation and filament power but requires -ve grid bias to turn it off, rather than +ve bias to turn it on. (This statement is an over simplification but is probably the easiest way to broadly differentiate these parts). The 812A duly arrived from my supplier in Huddersfield and was quickly tried. I raised the grid bias resistor from around 3 k to 10 k Ohms to get roughly the same input power for any given HT voltage, as compared with the 811A I'd already characterised. I got more output power from the 812 - an appreciable percentage of the 811A's RF seemed to end up in the grid circuit! The 812A has a lower gain although as the Hartley oscillator's feedback is easily adjustable this doesn't appear to have made any difference. There are just two wires that connect the top of chassis to the underside. The red wire connects to the tapping in the coil and feeds the HT into this circuit. The black wire connects the grid end of the tank circuit to the grid (via the under chassis coupling capacitor). Both cables use plastic insulators made from "rawl" plugs. Also visible the top view picture is a black wire looped around the coil. This is the single turn output link winding. A piece of coaxial cable comes up through the centre of the wooden dowel and connects to an SO239 coaxial socket on the back of the unit. The schematic of this transmitter is shown below. The basic Hartley oscillator is composed of the coil, 500 pF variable & 470 pF fixed capacitor, 10 k grid leak resistor and the 812A triode. The 1 nF and 10 nF capacitors are for decoupling and the 33 Ohm resistor and ferrite bead (FB) are to ensure no parasitic oscillation takes place. A centre tapped filament transformer was not available and so the two 27 Ohm resistors were use to provide the common point for keying. A two pole three position switch is used to select transmit, receive or net operation. In the net position a high value resistor causes the circuit to oscillate at low power so the frequency can be adjusted without transmitting a signal on the air. The signal marked "T/R control" controls a transmit/receive relay which is used to switch the antenna between the transmitter and whatever receiver is being used. All my standalone transmitter projects include this ground to transmit control signal. The coil former is about 40 mm (1.5 inches) in diameter. With the capacitor used the unit will tune from down below the start of the 160m band up to at least the top of the 80m band although it's too drifty (in my opinion) to be used on 80m. I used Microsoft Paint to draw this diagram (as a .bmp prior to saving it as a .gif). The symbols are from the "TubePad" library produced by Gary, WD4NKA (linked above and from the links page). 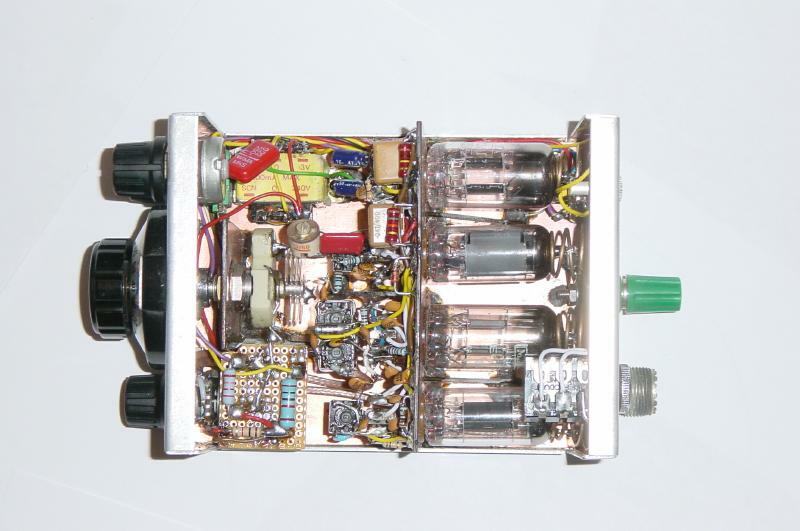 This transmitter produces a just acceptable 12 watts output from 750 volts HT but is quite nice at 4-5 watts output which is obtained from about 400 volts HT. With a 1300 volt supply, 50 watts was produced, at 90 mA input current but slow chirp was quite noticeable. I think this was caused by the valve heating up when the key was down and it's inter-electrode capacitances changing, shifting the frequency slightly. Key down the frequency was pretty stable but if the transmitter does not sound nice the extra power is of limited utility when establishing contacts. I need to brush up on my Morse skills to make reasonable use of this transmitter. Being a very un-ambitions DX operator even short distance contacts are welcome, especially when using a transmitter with just a handful of components in it. 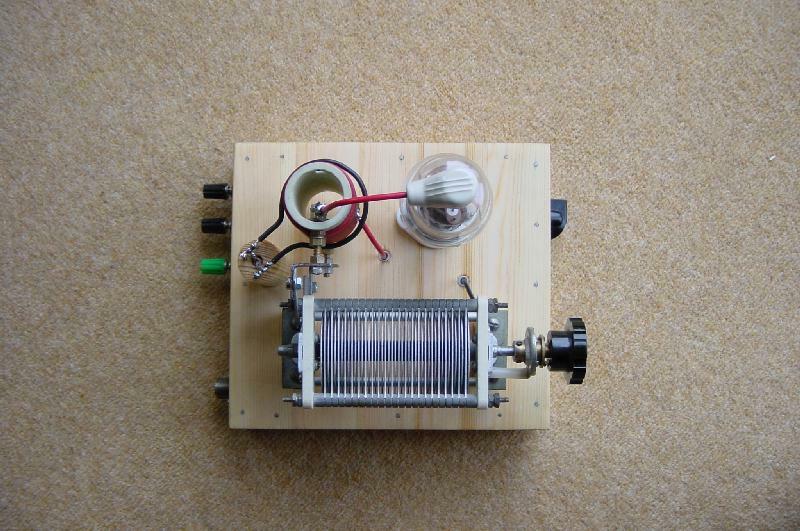 This works best generating about 10 watts of RF, obtained from about 700 volts HT. The same circuit produced 100 watts of RF output after optimisation for maximum power, and the use of a 1700 volt supply! The efficiency was estimated at around 60% in both cases with harmonics at 36 db (or greater) below carrier power. The two valves lying on their sides are OD3 voltage regulators. Used in series, they clamp the screen voltage to 300 volts (key up). When the key goes down, the screen voltage falls and the purple glow was extinguished. Most, if not all, of the original Hartley oscillator transmitters employed triodes, if only because "screened grid" tubes such as tetrodes and pentodes had yet to be developed, or at least come into common usage. I wanted to try a tetrode in a Hartley because a) I had some of the required power rating and b) the additional grid allows some extra control of the operating conditions of the valve. I experimented with the screen grid voltage but found the circuit worked best with relatively low operating screen voltage, this being obtained simply from the anode HT voltage via. a high value dropper resistor (50 or 100k). I was not happy with the 813 in this circuit. It was not possible to eliminate a noticeable Frequency Modulation imposed by the AC heater current, despite trying several methods to null it out. The FM on the carrier made the received CW note sound "dirty" or "raspy" not like the pure tone that is pleasant to receive. By using some crude adapters I was able to try an 811A, 203A, 807 and 4-125 in the same set-up. All the directly heated valves (that is all those mentioned except the 807) had FM problems, although the 811A and the 4-125 were better than the 813 and 203A in this respect. Whilst the 807 was FM free, it was very sensitive to changes in the HT voltage. Noticeable and unpleasant "chirp" resulted from keying, even with a fairly stable PSU and a stabilised screen voltage. The overall winner by a clear margin was the 811A. The transmitter output was connected to a special dummy load that has a -20 dB output to monitor signals. I generally connect this monitoring o/p via an additional, inline, 20 dB attenuator to the HP141 spectrum analyser input. 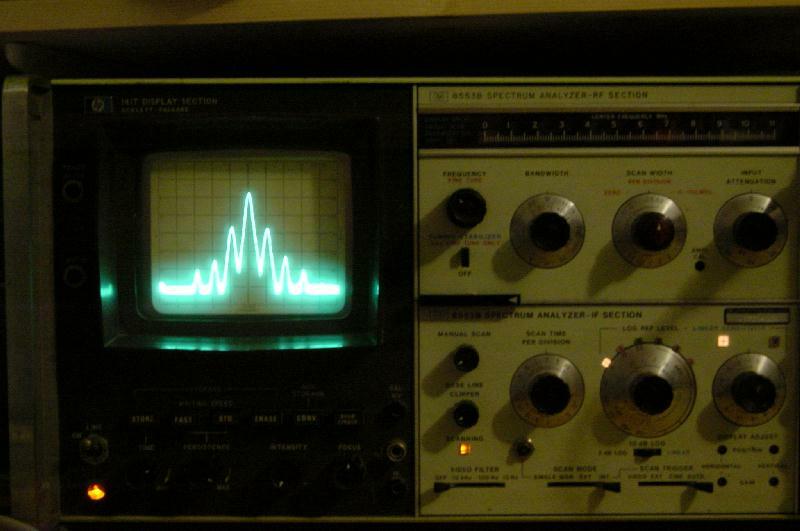 It is all too easy to damage the sensitive mixer on the input of a spectrum analyser with large signals. I was not able to get this test chassis running well enough to simply build it into an enclosing case complete with PSU. I decided that at the voltages required to operate this circuit, enclosure was an absolute requirement for regular use. A few months after this testing, the parts were re-assembled to become the 812 Hartley detailed further up the page. 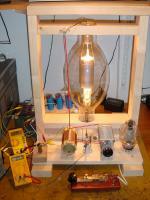 The 203A triode used turned out to be rare but many other triodes would work well in this application. It was picked as it was available and could dissipate more power than was required. You'll notice that this rig was a complete lash up but it worked never the less and (perhaps) more importantly it whet my appetite for the "open style" of simple transmitter construction. 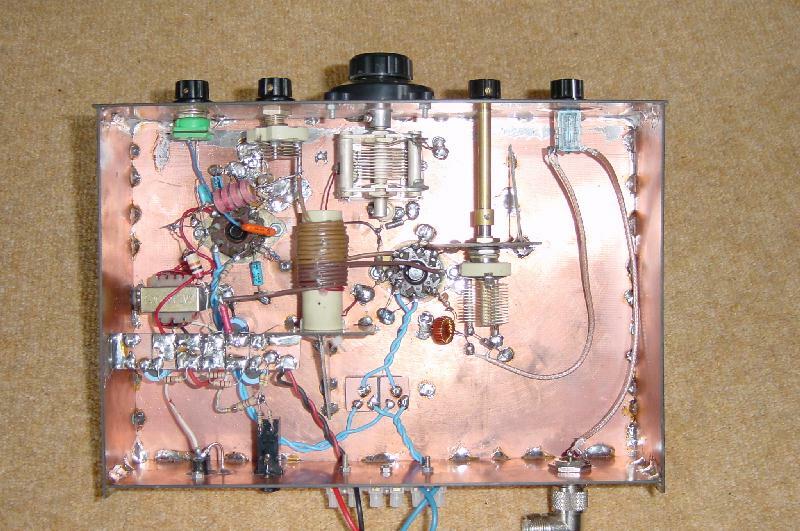 This transmitter produced a just acceptable 10 watt output but would have been better with perhaps just 2-3 watts output. The circuit was tested up to 780 volts and at that voltage produced in about 15 watts on 160 M and 22 watts on 80m although at these outputs the circuit was far too drifty to use. The inductor wound was too small (at only 16 uH) to provide a reasonable loaded Q on 160m. It did resonate on 160m with the appropriate value of capacitance (about 400 or 500 pf) but actually gave a larger output on 80m where the tuned circuit was better matched to the valve. The drift was actually about the same on both bands, the better match on 80m compensating for the increased frequency. I decided to build a bigger version in a metal case and so - regrettably I dismantled "Hartley 203A" to use the parts for the 813 (& others :) test Hartley detailed above. After unwinding the coil, I ended up winding an almost identical one again in the hopes of covering 2 bands! This circuit was inspired by a re-print of a German WWII single valve crystal controlled transmitter in the "Technical Topics" section in the RSGB "Radio Communication" magazine. One evening I decided to knock up a derivation of this circuit using an 807 tetrode. The 807 will dissipate 25 watts and so with only the 5-10 watts input I envisaged for this circuit I hoped it would be robust and un-flustered. You'll see from the picture the unit is no work of art and also as it is not enclosed offers a risk of electric shock. 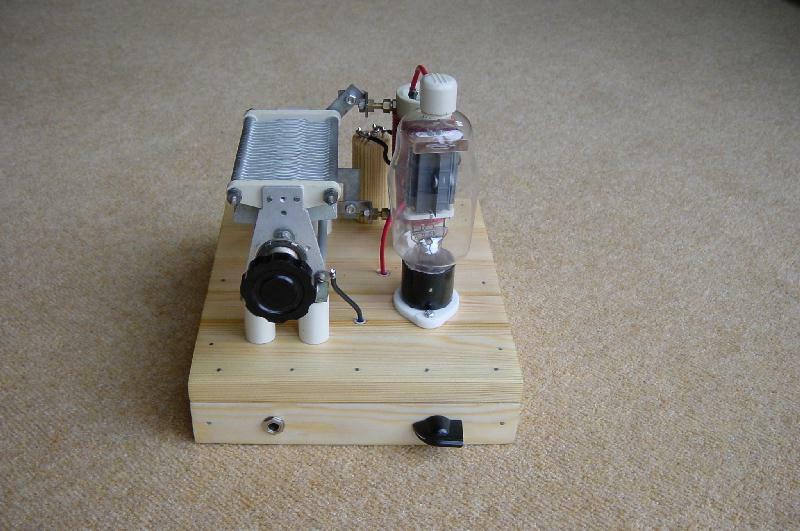 I will re-build this sometime, probably using a 6L6 tetrode and a proper aluminium box. The 6L6 is a close electrical equivalent of the 807* but because the anode connection is via the base (together with the other connections) it's easier to enclose all the live parts without having to build an enclosure for the entire valve. The circuit employs a parallel resonant tuned circuit itself in parallel with the 807. Two extra windings on the coil former are used, one provides feedback to the grid of the 807 via the crystal and the other is the output winding, used to extract the RF power from the circuit. By using 2 separate windings to control the feedback and output coupling the circuit could be optimised fairly easily to ensure reliable starting, low "chirp" with good output. Small crystals plug into the unit using a section of IC socket! I have rocks for 3.555, 3.560, 3.565, 3.579 and a non CW segment frequency 3.686 (Baud rate crystal). I tested one of my 3.579 crystals using HT up to 500 volts (and obtained outputs up to 20 watts in the process) but the crystal remained OK so far as I could see. I therefore figure that the crystals should be OK at lower powers. Keying is direct, via the cathode. Not (that) safe but certainly expedient! The transmitter sounds best at about 5-7 watts output which makes for a reasonable signal. Below is a table of input voltage and current for RF outputs ranging from 1 to 10 watts. I'm not sure how accurate my RF power meter is (it's part of an inexpensive ATU and SWR meter) but I hope it's at least a reasonable guide to the power. The efficiency values quoted at about 60-65% are what I would expect for a class C oscillator. The output is surprisingly clean with the strongest harmonics being at least 35-40 dB down on the carrier even without the low pass filter I added "just to make sure". *Actually the 6L6 has reduced ratings for power and voltage as a result of the smaller glass envelope and insulation limitations of the base design. 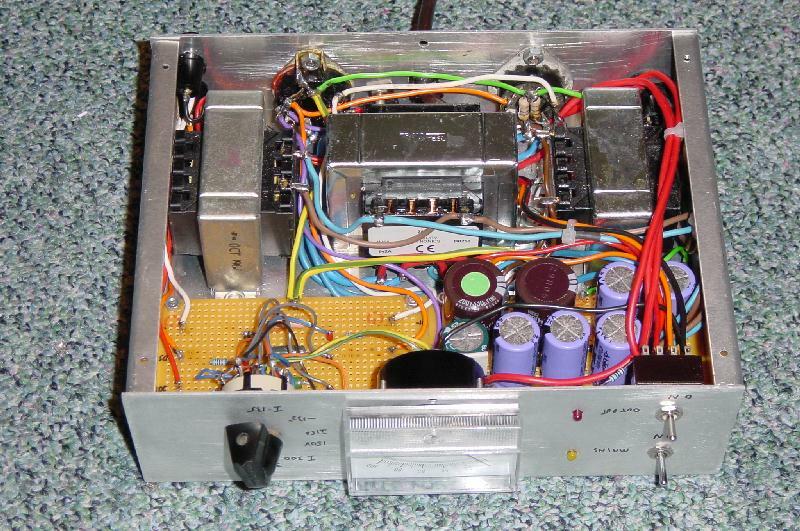 I built a regenerative receiver as a kid using a single MPF102 JFET and the range of Denco "green" plug in coils. 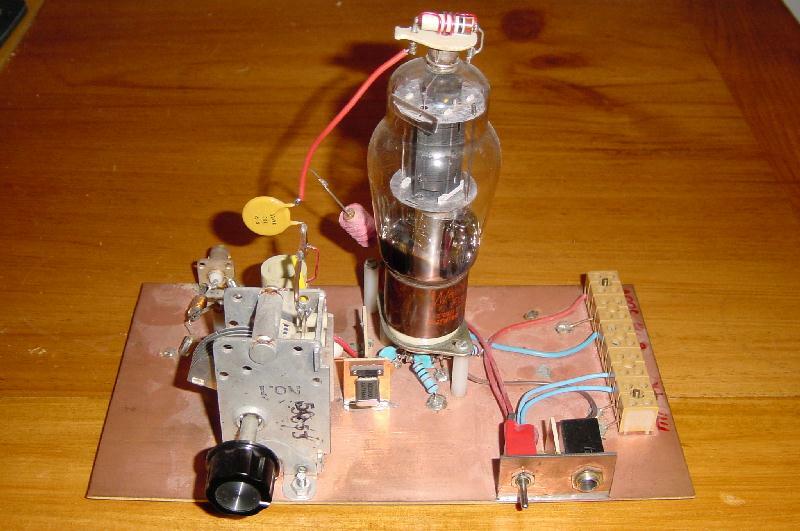 It didn't work well as a Ham radio receiver although I used it for years on the Medium Wave and 49/41 meter broadcast bands. Since getting interested in "glowbug" transmitters and receivers I read much about the potency of the regenerative receiver and I hate to admit that I didn't believe that these receivers would be particularly good. Boy, was I was wrong! After some deliberation I decided to build a regenerative receiver using a pair of the ubiquitous 6SN7GT double triode tubes. I decided to err on the side of caution as I believed that having 4 sections to play with would mean if my radio was not as optimised as it might be, it would still provide reasonable performance. I wanted the luxury of a front end amplifier (to isolate the detector from the antenna a little and vice versa) and also the ability to drive a loudspeaker, not just headphones. I decided to concentrate the coverage on just one frequency band, 3.5-3.8 MHz, the 80m band. The slow motion drive I used only offers about a 1:8 reduction ratio giving the unit a tuning rate of about 75 kHz a turn, much too high by accepted standards. The radio is usable none the less, providing the operator has not consumed too much beer at the time of operation! The RF amplifier stage is in the grounded grid configuration - this approach together with the low mu (gain) 6SN7 provides a stable amplifier with only a little gain. I did try the higher gain 6SL7 valve in place of the second 6SN7 (which is used for the audio pre-amp and output stages). I had to alter the cathode bias resistors for both of the 6SL7 stages to get the correct standing currents. The unit did give a more audio output but was prone to oscillation. In the end I decided that it was easier to use 2 identical valves in the circuit and replaced the 6SL7 with the original 6SN7 and restored the previous bias circuitry. I run the audio stages of this circuit from around 220 volts. A lot of regenerative circuits often use only a few tens of volts on the detector although my detector is fed from about 80-90 volts. In the next version I make will follow the conventional wisdom a little closer - perhaps also accepting headphone only operation with 1 valve. I've heard a lot of contacts on this radio. Generally, it can hear anything that my Yaesu FT200 transceiver (my usual radio for 80m) can hear* . When I heard VK on the 'genny the European stations in QSO with him were really struggling to work the Australian. I'd have been struggling a little too, but no more I think. The thrill of looking at 50 year old valves glowing and bringing in a signal from the other side of the world is quite something. * I've since started using a Drake R4C on 80m. This radio can hear things that neither the 'genny or the FT200 are able to receive. This is a dynamic range and filtering issue, rather than one of absolute sensitivity. I recently borrowed an RF signal generator and using this I was able to measure the MDS (or Minimum Discernable Signal) level for this radio. The signal generator's carrier could be heard clearly at a level of -110 dBm. It was even (very) faintly audiable at -120 dBm, that's 1 x 10-15 watts or a quarter of a micro volt signal into 50 Ohms! On the 80m band this sensitivity is more than acceptable (at least at this location) because of the high level of noise present on the band. The FT200 has an MDS of -140 dBm at 3.8 MHz and -135 dBm at 28.5 MHz. Having built the regenerative receiver I decided that custom low power valve Power Supply Unit (or PSU) would be of great value when developing such circuits. I do have a trusty 6.3V 4A AC and adjustable 250-325V @ 100mA DC PSU but it is fairly large and doesn't provide lower HT voltages, 12V DC or any negative bias voltage. A 12V DC rail is useful for powering relays and also the filaments of high gain audio stages where hum induced from an AC heater line can be a problem. 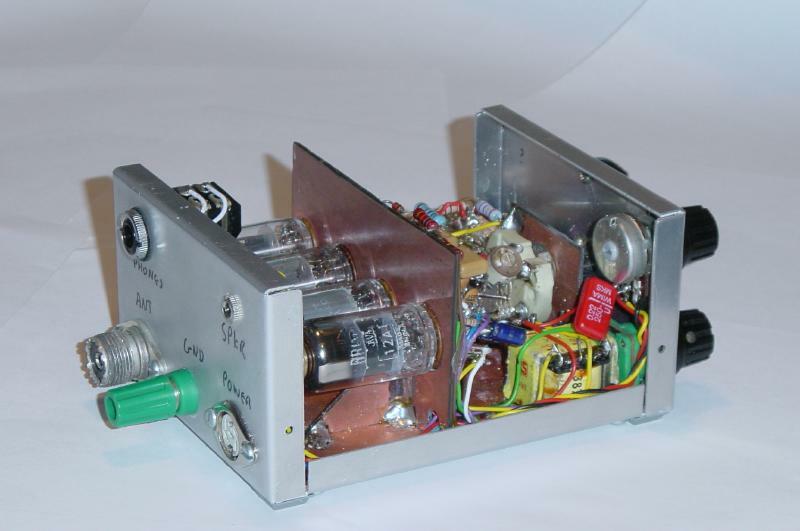 Negative voltage rails are useful for both fixed bias configurations and also switching off individual stages, a technique often used for T/R switching in valve radio transceivers. I decided that 6.3V AC, 12V, 150V, 300V and -130V DC would cover most applications and could be accommodated in a small case using the parts I had. The unit has metering for current and voltage on the -130, +150 and +300 volt outputs, these outputs are also individually fused. The PSU contains 3 transformers: 240->6V 4A, 240->15V 1A and 240->12V 1A. 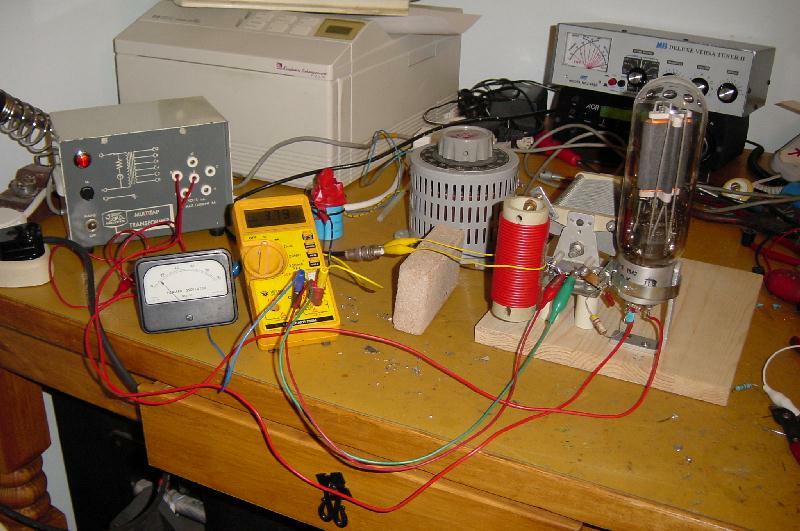 The 240->12V transformer is actually used as a "step up" transformer with its "12V" winding connected to the 6V AC output from the first transformer. When used in this configuration its "240V" winding provides 120V AC. This 120V AC output is rectified and doubled using a "full wave doubler" circuit. With the most negative point of doubler grounded, the configuration provides both the +150 and +300V DC HT outputs. The maximum allowable current from these 2 rails is a total of about 50 mA, ample for many small circuits. The 15V transformer output is rectified, smoothed and regulated (using a 7812 regulator) to provide 12V DC at 1A. The 15V AC output is also multiplied using a ladder type voltage multiplier and generates the -130V DC rail. In addition to driving the step up transformer, the 6V AC can be used to power nominal 6.3 volt filaments. The transformer used actually provides a little more than 6 volts (depending on load) and the output is within 10% of a nominal 6.3 heater supply for all reasonable output currents. Two octal sockets provide duplicate access to all supply rails and a 4 pole switch allows the isolation of the -130, 12, 150 and 300 volt outputs. To turn the 6.3 volt output off you must turn the whole unit off. The PSU works well except that the regulation of the 150 and 300 volt rails is very poor, falling by more than 25% from no load to full load. Putting two transformers effectively in series from a regulation point of view has the unfortunate effect of compounding the drop in output voltage with increasing load. Even allowing for the two transformers, I still feel the HT regulation is poor. The smoothing capacitors are 330 uF and so at the low currents drawn are relatively huge. The resistance of the 120V output winding is 240 Ohms (which will appear as 480 Ohms due to the voltage doubler) and will therefore contribute a 24 volt drop at 50 mA output current. I am currently considering what to do about the regulation. I may rebuild the HT circuit by disconnecting the 6V AC from the 12V winding, connecting the 240V winding to the mains and connecting the secondary to an additional voltage multiplier. The 12V "1A" winding is actually two 12V 0.5A windings in parallel, connecting them in series would yield 24V RMS or about 35V DC per multiplier section. Using an 8 section multiplier with outputs at 4 and 8 taps voltages of around 140 and 280 volts would be produced. The main issue here is fitting the additional capacitors in the box. Maybe there is room above the metering board, shown on the left side of the underside shot.